Is one page responsive theme. You can edit styles using CSS3 or LESS. Good and detailed documentation is ready in bootstrap style written. It has also included PSD files to speed up you creative process. It has created flexible HTML5 layout which will allow you to edit and adjust Treble to your needs. Treble includes Ajax loaded pages, for example Portfolio items. It was created Blog section if you want to extend your website. With latest blog which is implemented in one page and Blog list separate layout with blog posts. 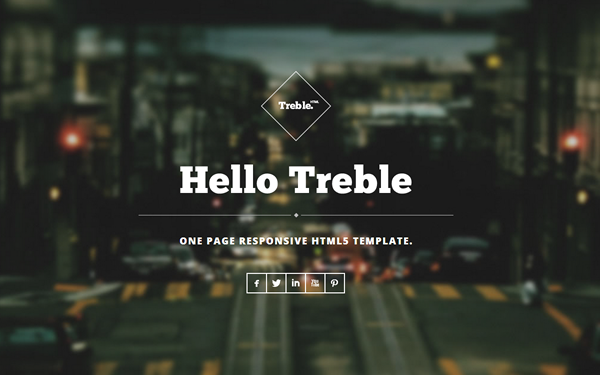 Item Reviewed: Treble - One Page Responsive Bootstrap Theme 9 out of 10 based on 10 ratings. 9 user reviews.